From the top of the mound, I can’t see much. Some trees. A sky mottled with the clouds that over the past few days have soaked this grassy meadow in the Sierra foothills. And a pair of hands, ostensibly attached to a human being with their arms held high, beckoning me forward. Obeying them seems like a terrible idea. About as bad as driving up to the top of this slope in the first place. But orders are orders. I engage my core, clench my cheeks, and push my right foot onto the accelerator pedal. The 3.6-liter V6 engine responds, and the four 32-inch wheels, clad in mud-loving tires, roll forward. 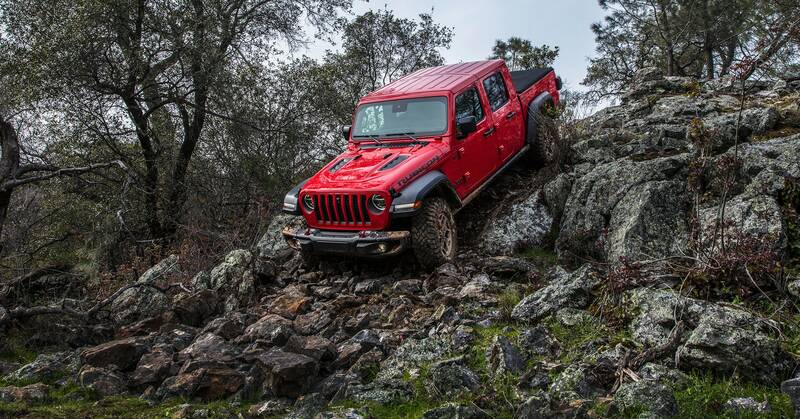 And so the Jeep Gladiator pickup truck rumbles down the rock-strewn, 35-degree slope with all the eager, confident spasticity of a big dog bolting down a marble staircase. A few seconds later, just as I’m starting to wonder if the afterlife really does look like Northern California, my guide turns his hands into fists to signal ‘stop,’ then gives me a thumbs up. “Good job!” I manage a nervous smile, but know not to take any credit. Jeep’s engineers have built the Gladiator for just this kind of folly, and they’ve invited me onto this off-road course because they want to show me just how good a job they did. At a time when SUVs and pickups have never been more popular, the Gladiator is an about-time return to form for Jeep, which offered pickup versions of its vehicles from the late 40s through the early 90s. The front bit borrows heavily from the Wrangler, but the team insists that they didn’t just slap a bed on the existing ride. “The challenge for us was to develop a truck that’s a truck,” says Pete Milosavlevski, the Gladiator’s chief engineer. Over the three years they spent developing this ride, Jeep’s engineering team made a series of choices that sought a balance between utility, ruggedness, and creature comforts. It equipped the Gladiator with solid axles, stronger wheels, the largest brakes in the segment, a bigger grille to bring in more cooling air, a “tried and true” steel bed at a time when competitors are going with aluminum and even carbon fiber. Because they made the doors and roof extra easy to pop off, the Jeep’s designers stuck lockers both behind and under the rear seats, so you have places to store your valuables while you’re kayaking up that waterfall. They included a 115-volt outlet in the five-foot bed and a portable Bluetooth speaker that will survive half an hour underwater. It would take a few weeks of living with the Jeep to verify that all these little touches are good ideas, but a few minutes of bouncing over rocks was enough for me to appreciate the decision to rubber-wrap the armrests and door handles. That and the heated seats. The four-door Gladiator starts at $33,545 (for the manual transmission Sport edition), but if you’ve got money to spend, a fully specced Rubicon version will run you closer to $60,000. Production at Jeep’s Toledo plant starts in April, with deliveries slated for May. Buy now, and you’ll get that 3.6-liter gas engine, good for 285 horsepower, 260 pound-feet of torque, and an EPA-rated 19 miles per gallon. Wait a year or so, and you can opt for a 3.0-liter diesel that will take the torque up to more than 400 pound-feet. As I get step on the gas, though, I discover that the 260 figure is more than enough to go bobble-heading over the kind of terrain that in just about any other vehicle (including my feet) would make me say, Whoops, better take the long way ‘round. And by the end of the 30-minute off-road exercise, after watching the vehicle’s pitch and roll gauges whip to and fro like The New York Times’ election needles, I’m wearing a genuine smile. Most buyers won’t get anywhere near the limits of what the Gladiator can do—like happily plow through 30 inches of water—but those who do are sure to be entertained.